Fortunately, most cyclists do not have to contend with things like this. Is probably mislabeled in that the deer was just being a deer and trying to get through an area. The cyclist just happened to be in the way. Had seen on another CZT's blog about putting tangles on the insert of a travel mug. Had tried to do some things before and just did not get to it. Finally was able to get something done. Have been working on this instead of doing the Dare and Challenge. Has a dual purpose as these are for gifts for staff in our office and I also want to have a class on this as well as do some for the Art and Craft show later this year. The hard part was getting the template right. The company that I got the mugs from included paper for the insert, but no template. After a few struggles and searches of the internet, and some modifications of the template, was successful in getting something that worked. Below is the result. Other than the letters, this was done in Zentangle style. After I did the letters I did a string to divide the insert into sections and then began doing tangles. This is not shaded yet. Will try to take a picture of it after shading just to show the difference. Had a little difficulty deciding on the tangles to use, but am pleased with the results. I chose to use colored card stock rather than white. Have 4 more to do. Will all be different colors. Will post the results later. As always, comments are welcomed, encouraged and appreciated. Thanks for visiting. Think this would be fun to do. Do not have places like this in Central Indiana. Not sure that will ever have the opportunity as I only have street bikes. Do not think that my hybrid would stand up to this type of terrain. I would probably go at a much slower pace also. Have had encounters with wildlife and animals on rides but never anything like a bear. Have just had to contend mostly with rabbits, squirrels, chipmunks, dogs, and an occassional deer or wild turkey. Wonder if bear sightings are not too unusual and that the bear is use to people around. It did not seem too alarmed when the riders went by it. The riders did not seem too alarmed either. Not sure what happened to the video link that was on here. If interested, click here and go to you tube to view it. This caught my eye. Maybe it did because I live in a community that has a long auto heritage. Cars and speed have always been issue. I think there has always been a fascination with anything that moves to see how fast you can make it go. This guy was apparently clocked at over 80 mph. The fastest that I have ever gotten my bicycle up to was 30mph and that was downhill. that was difficult enought to control. Not sure what it would be like trying to control this thing. While it is kind of neat to watch, will leave the experience to just viewing it. Cycling - Winter time can be fun!! I have not done a lot of posts about things other than Zentangle®. This is mostly due to time and also because that is what I have been spending most of my time doing. I still run across some other things that are interesting. I do like to ride my bicycle but have not done it as much in the last 4-6 months. I usually ride throughout the year, which is very doable in central Indiana. Can dress for the cold and do not ride a lot in the snow. It is possible but I do not have the right equipment to do so. 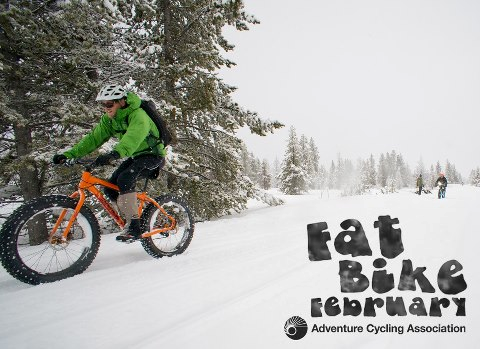 Adventure Cycling Association recently shared this photo on a post. I do not own a bike like this but think it would be fun if could ride one. This Photo was taken by Casey Greene. I have never ridden a bike with tires like this but think it would be a blast. I like being out doors in the snow. Not sure where this was taken. Was not sure how much I would be able to participate in current Dares/Challenges. One thing that helped was that I have been home for the second day with what I think is the GI virus going around. Yesterday did not feel like doing anything. Today is a little better and need to get back to work tomorrow so wanted to motivate myself even though I am not 100 %. What better way to do it than tangling. The other is that after seeing Erin's template and the tangle in Laura's UMT, felt like I could combine both challenges with only one tile. Have not done this before. The Bright Owl's dare had to do with when, and if, you felt like an artist. Anyone who has read "the about me" section of my blog knows that I did not see myself as an artist, or doing art because I could not draw "things". Most of what I saw was people that could sit down and draw people, cars, etc. Once I started doing Zentangle, I think my perspective changed. It wasn't that everything I first did I considered to be art. The earlier things I think would best be described as experimentation. I was drawing patterns. As I progressed, I began to look at actions being purposeful. This did not mean that I planned out every tangle I was going to use, but once I started doing something, I focused on what I wanted to do and not just duplicating a pattern. I think the other thing that changed was when I started to tackle the area of shading. I am still on this journey but feel that shading makes such a difference in how a Zentangle ® tile looks. I guess the easiest way to describe it is similar to what Erin said in her post. I began seeing what I was doing as creating something and just not doing something. I guess I would say that is what makes me feel like an artist. To me, that is one of the great parts of the Zentangle® art form. It allows every one to tap into that inner artist and create. Being human, it also helps when other people make encouraging and positive comments about the tiles or other items I have created. It is an additional affirmation. Laura's Challenge was to use the Margaret Bremner's tangle Dansk(can click on her name to see this tangle). This is where I digressed a little from Erin's Dare, in that she said to use tangles that we liked and helped us with making us feel like an artist. Dansk is a tangle that I have never used before. I had seen it and thought it interesting but had not used in anything. The other tangles that I used are ones that I have used and some of them are my favorites. 'Nzeppel is one of my favorites. I just like the way that it develops and what it becomes. The beads are ones that I think can highlight and also help separate parts of the tile. I have really grown to like the organic tangles, no pun intended. Flux and Zinger are fun to do and I think also help create an effect. Sometimes it softens a tile. Other times I will use almost all organic tiles just to create a scene/effect. Hopefully, I was able to successfully address both the Dare and the Challenge with this endeavor. Here it is. I hope you enjoy it. If you have not all ready done so, would strongly encourage you to visit both The Bright Owl and I Am the Diva to look at all the other great pieces submitted by some very talented artists. Almost forgot to mention that Laura at I am the Diva is also conducting a give away of a Carol Ohl's Tangle-a-Day Calendar. You can find how to participate on Laura's blog. As always comments are welcomed, encouraged, and appreciated. Hope you are enjoying your journey with tangling and developing the artist within you.